Weight gain has a clear and obvious time dependence. People tend to gain weight slowly, over years or even decades. Many people start off as a skinny teenager (age 20), but gradually gain 1-2 pounds per year. This isn’t so bad, but after 40 years they may be up to 80 pounds overweight (age 60). Weight loss is also time dependent. Those who have been struggling with their weight for long periods tend to have more trouble than those with more recent weight gain. This all relates to insulin resistance. Those who have recent weight gain do not have enough time to develop severe insulin resistance and therefore dietary changes are successful at reducing weight. The roots of this time dependence lies in the Hormonal Obesity Theory. For the previous post – click here. To start with Hormonal Obesity part I – click here. Those who have struggled with their weight for decades may have developed severe insulin resistance. If the insulin resistance is now driving the high insulin levels, even dietary changes may have a very modest effect on reducing the insulin levels. Resistance itself depends on high insulin levels but also the persistence of those levels. Therefore, we can help prevent the development of resistance by affecting meal timing (the question of “When to Eat”). Those skinny teenagers have little insulin resistance. Over each ensuing decade, the insulin resistance gradually increases and they develop severe insulin resistance. Since Diabetes type 2 is a disease of increased insulin resistance, they are now diagnosed with type 2 diabetes. They now have diabesity and the rest of the metabolic syndrome. There have been two major dietary changes since the 1970′s. The first change was in the macronutrient composition of our diets (What to Eat). We changed from a higher fat (45%) to a low fat culture. In doing so, we inadvertently increased the carbohydrate composition of our diets. Increasing carbohydrates is not necessarily bad, but when those carbs are all refined carbohydrates we have a problem. This stimulates insulin and weight gain. We explored this in earlier posts. The other major dietary change has been in meal timing (When to Eat). We changed from 3 meals a day with no snacks to 6 meals a day or snacking all the time. Societal norms which previously had frowned upon eating outside of the table now permits eating almost everywhere. In the 1970′s we would eat breakfast at 7:00am and dinner at 7:00 pm. That means we spend 12 hours in the fed state (insulin dominant) and 12 hours (from 7:00 pm to 7:00 am) in the fasted state (insulin deficient). In the 1990′s and 2000′s we have changed to eating all the time. We eat as soon as we get up in the morning and eat just before going to bed. Therefore, instead of a balance of fed and fasted states, we spend most of our time in the insulin dominant state. Resistance in a hormonal system depends upon 2 things. There must be high, persistent levels. The dietary changes we have made since the 1970′s provides these exact pre-requisites. The high insulin levels are sufficient to drive weight gain and obesity. The insulin resistance is synonomous with type 2 diabetes. We have created the diabesity epidemic with our disastrous, misguided dietary changes. The most ironic part of this entire debacle is that these dietary changes were prescribed to reduce the epidemic of heart disease. Instead, we have actually encouraged it. We are putting out a fire with gasoline. One of the major obstacles to health is conventional dietary advice. It becomes obvious that we must restore balance between the fed and fasted state. Ultimately, that leads to eating less. Whether that is eating less of the highly insulogenic foods such as sugars and refined carbohydrates (What to Eat) or eating less meals (When to Eat), it doesn’t really matter. In the end, we must eat less. However, our advice to lose weight usually involves eating more. Whether it is to eat more times/ day, more snacks, more whole grains, more fibre etc, our advice is always to eat more to lose weight. Why would we give such completely asinine advice? Such obviously-wrong- and-really-really-stupid advice? Because nobody makes any money when you eat less. If you take more supplements, the supplement companies make money. If you drink more milk, the dairy farmers make money. If you eat more breakfast, the breakfast food companies make money. It goes on and on. Since the food and drug companies are providing such big grants to the doctors and dieticians, nobody wants to hear the advice to eat less. “Eating Less” is like the weird uncle at the wedding nobody wants to ever talk about. The message has been corrupted from “How can I lose weight?” to “How can my company make money by pretending to help you lose weight?” Consider snacking – once a dietary taboo. This study “Increased meal frequency does not promote greater weight loss in subjects who were prescribed an 8-week equi-energetic energy-restricted diet” demonstrates that increasing meal frequency really makes no difference in weight loss or gain. 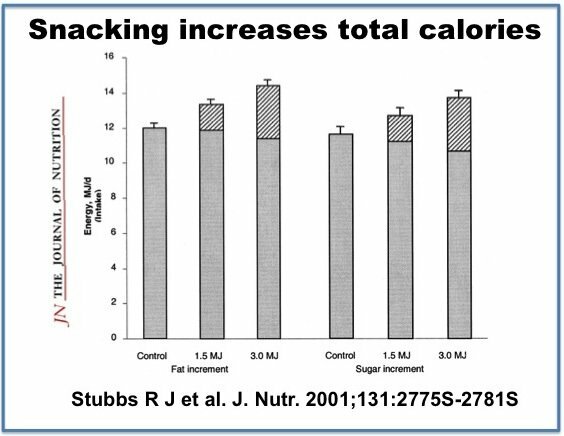 Snacking was investigated in this paper “Carbohydrates, appetite and feeding behaviour in humans” by Stubbs RJ and published in the Journal of Nutrition 2001. In this study, subjects were given mandatory snacks. There is a clear effect that snacking reduces subsequent caloric intake at mealtimes. However, this decrease in calories does not make up for the calories taken at the snack. Eating snacks does not decrease food intake, it increases it. (Duh). Yet the advice still persists to ‘graze’ through the day to decrease food cravings. There is no difference whether these are fatty or sugary snacks. The effect is much the same. The bottom line is that snacking tends to increase total intake of food. Even worse, it tends to increase the number of eating opportunities as well – so there is a doubly bad effect. Because snacks tend to be very high in processed foods, the quality of the food intake is likely to suffer substantially as well. However, it does open up large areas for the food companies to profit from selling us snack foods. There is a much larger profit in selling processed food compared to real food. No wonder the large food companies have been as enthusiastic as a hostess forcing leftovers on departing guests. Breakfast is another area where there is much confusion. Does skipping breakfast make us ravenously hungry and overeat the rest of the day? That is what many would have us believe. Breakfast is the most important meal of the day. The answer, though is much more nuanced. The word breakfast literally means the meal that breaks our fast, the period where we generally are sleeping. There is nothing in there that says we need to stuff our faces the minute we roll out of bed. Neither is there any reason to make this meal full of sugar and refined grains. If we eat our first meal at 12:00, then lunch will be our “Break Fast” meal. What’s wrong with that? The main problem with breakfast, as explored here in this paper “Impact of breakfast on daily energy intake” published in Nutrition Journal 2011. 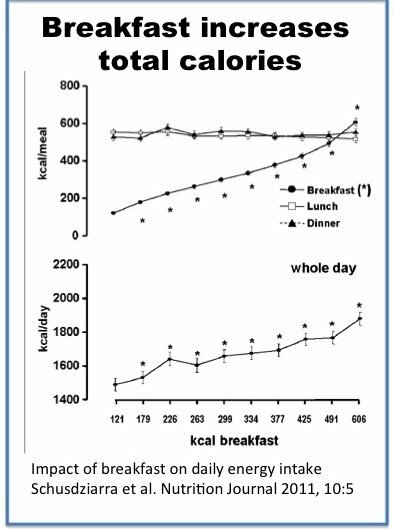 In this paper, researchers broke a group down according to the number of calories eaten at breakfast. Increasing food intake at breakfast does not seem to reduce food intake at lunch and dinner. Therefore, the more one eats at breakfast, the more one eats overall throughout the day. Worse, it increases the number of eating opportunities and times we stimulate insulin secretion. The real problem with breakfast is that we are always in a rush in the morning. Therefore, we tend to eat foods that are highly convenient such as sugary cereals and other easy to prepare foods like toast, sugary yogurts, danishes, muffins, instant oatmeal and the like. Food companies, seeking an opportunity to sell more highly profitable, highly processed “breakfast” foods swooped in like flies on stink. “Eat Breakfast” they thundered. “It’s the most important meal of the day!”. You can lose weight by eating breakfast. You can lose weight by eating more snacks. No, my friend, you can’t. Thanks this is really good information. Can a person be insulin resistant and not have high blood sugar?